Iowa Barn Foundation Book Available! This barn, the Robinson Barn, is featured in Heritage on the Prairie (click here for an order form (PDF). Heritage on the Prairie, a colorful book featuring photographs and brief histories of Iowa barns, has been published by the Iowa Barn Foundation and is now available. The foundation, founded in 1997, is an all-state non-profit group dedicated to preserving Iowa's barns. The foundation has awarded matching grants to about 150 barns throughout the state. Dedicated to barn preservation, photographers, writers, editor, and assistants were all volunteers who donated their expertise to the creation of the book. Several of the photographers and writers are professionals. The foundation raises money and gives grants to property owners throughout the state. The book features photographs of some of these barns. Some are on the foundation's annual fall tour featuring barns that have received grants or been restored by the owner. The cost of the book is $29 plus $5 if it is shipped. Our Order Form (a PDF) for the Heritage on the Prairie book can be downloaded, printed, and sent to us. (Or call Roxanne Mehlisch, Iowa Barn Foundation board member, at 641 487-7690). The foundation is grateful to Theresa Zaruba, account manager, J and A Printing, Inc., Hiawatha, Iowa, and Deanna Roberts, Letter, Type and Design, Marion, who went above and beyond in printing the book. They worked to make it an attractive book that would be enduring. [Excerpt from the introduction] "For over 300 years, from 1650 to 1950, the American all-purpose barn, usually the most prominent building on a farm, was the center of hard work focused on making a livelihood from raising crops and animals. So important was the barn that it was often built before the house. Sometimes the family lived in the barn until the house was built." "It is important that Iowans save historic barns. They offer us a sense of place as a “Cathedral on the Prairie.” Fortunately, for barn enthusiasts and historians, many farmers are willing to ignore profitability in the interest of tradition and heritage to maintain their barns heritage. The photographers, editor, writer, and assistants who contributed to this book were all volunteers dedicated to saving important symbols of Iowa’s agricultural heritage." The photographers, editor, writer, and assistants who contributed to this book were all volunteers dedicated to saving important symbols of Iowa’s agricultural heritage. Founded in 1997, the Iowa Barn Foundation is dedicated to preserving Iowa's rural buildings, symbols of Iowa's early agricultural heritage. The Iowa Barn Foundation is an Iowa non-profit corporation with tax-exempt status under paragraph 501(c)(3) of the Internal Revenue Code of 1986. The Iowa Barn Foundation, its board of directors and county representatives work to preserve Iowa's agricultural history and endangered barns by educating people in Iowa - and beyond - about our rural heritage and the importance of barn preservation. This is being accomplished through the bi-annual Iowa Barn Foundation Magazine, the Iowa Barn Foundation website (this website), the annual All-State Barn Tour, and through picnics, open meetings, and through worldwide publicity in newspapers, magazines, and television. We provide matching grants to property owners to help restore qualified barns. Also, the Iowa Barn Foundation gives Awards of Distinction to those property owners who restore or rehabilitate their barns at their own expense. Details of these and other programs are on our Barn Preservation Awards, Grants, Programs, Funds, and Taxes webpage. For instance, the Iowa Barn Foundation is committed to farm conservancy and now accepts economically and financially self-sustaining farms and farmland. These farms and farmland are saved in perpetuity for agricultural purposes according to the owner's wishes. As of August 3, 2015, the Iowa Barn Foundation has been providing incentives for barn owners to take advantage of tax credits that are available from the federal government and the state of Iowa. Funds for Matching Grants, Awards of Distinction , and the Iowa Barn Foundation Magazine, are raised from individuals, corporations, and foundations. To date, all of the funding has been generated from private sources. Financial, legal, editorial, and administrative work is carried out by volunteers. We need your help to preserve Iowa's barns. Please make a donation or become a member of the Iowa Barn Foundation today! If you have questions or would like more information about the Iowa Barn Foundation, contact Jacqueline Andre Schmeal, with the subject line "I would like more information about the Iowa Barn Foundation". The Iowa Barn Foundation, a non-profit organization founded in 1997 and dedicated to preserving Iowa barns, continues to work to save vulnerable barns on our countryside. The foundation, an all-state, all-volunteer effort, gives matching grants to barn owners, sponsors an all-state barn tour which educates old and young about the important role of barns in Iowa’s history, and publishes the semi-annual Iowa Barn Foundation Magazine. The Iowa Barn Foundation's county representatives help to promote the preservation of barns, organize the surveying of barns in their counties, encourage membership in the Iowa Barn Foundation, and help with fund raising. Working with members of the board from each of nine areas of the state, they also help to oversee projects. Shortly after the Iowa Barn Foundation was launched in 1997, board member, Dr.Neil Harl, agricultural economist at Iowa State University, said, "We need to have county representatives - a representative for each county." And, so the Iowa Barn Foundation started recruiting barn-interested folks to take on those jobs. The board started with folks they knew, like dairyman Joe Lyon, Toledo, now in his eighties and still on the board. The board learned about county representative candidates from tours, from hearsay, and from notes from interested folks inquiring about the foundation. One man called to offer wood from an old barn he was going to take down. He was talked into restoring the glorious, historic family barn as well as being a county representative. The county representatives encouraged interest in barns, which they saw vulnerable because of the diminished role of barns on farms. Many of the representatives had grown up working in the family barn, and cared that they were preserved so people today would appreciate their history and their important role in making Iowa the premier agriculture state. These representatives took calls from county residents inquiring about grants given by the Iowa Barn Foundation. They have looked for interesting barns in their county that might be part of a tour or eligible for a grant. Then the Iowa Barn Foundation started All-State Barn Tours and then County Barn Tours. The first was orchestrated by Winneshiek and Allamakee representatives, Marlene and Duane Fensterman. They worked tirelessly finding historic barns in northeast Iowa. So many folks attended the tour from Iowa and beyond that they ran out of capons that were being served for lunch. The work of the Fenstermans is enduring. Later the New York Times ran a major story on the barns in that area, and people come from everywhere to see the northeast Iowa barns. ⚫ Through the years, county representatives have organized tours in many counties. The Iowa Barn Foundation All-State Barn Tour has become an annual event that folks look forward to enjoying. ⚫ A county representative is a contact in the county for folks wanting to know about Iowa Barn Foundation barn preservation grants. ⚫ The representative is a friend to barns that need to be discovered and preserved. ⚫ The representative is a "barn historian" - sending interesting information on historic barns in their county to the foundation and to the Iowa Barn Foundation Magazine. ⚫ And, the representative is a recruiter of barn-interested folks encouraging them to get involved with barn preservation. If a barn in the county has received a grant and is on the All-State Barn Tour, the county representative can assist if any coordination is needed. The Iowa Barn Foundation is twenty years old. Some of our devoted county representatives have "retired" from their duties. The foundation hopes that barn-enthusiastic folks will sign up to replace them. The foundation will help each new recruit, so it's an easy transition. Below is a list of present county representatives. Thus, counties not on this list need representatives. We hope that you will consider signing up and joining our effort. It's really about being a contact. If you have questions, please call...... A county representative can be proud for contributing to Iowa's history - to America's history. We want to save the barns that remain--buildings built by hard-working Iowans. You can help. Many of Iowa's 99 counties have representatives to the Iowa Barn Foundation. We welcome volunteers to represent those counties that do not yet have a representative. There are over 1500 members of the Iowa Barn Foundation. Become a member today! To become a member, or to make a tax-deductible donation to barn preservation and farm conservancy efforts, please complete the Membership Form (PDF). A membership of, at least, $25 gives you the bi-annual Iowa Barn Foundation Magazine. The Iowa Barn Foundation Magazine is packed with information about the history of Iowa barns - their builders and owners - and also restoration stories. The Iowa Barn Foundation has initiated a new program to highlight and preserve small barns in Iowa with the Small Barn Painting Project. Grant amounts were raised on 11-03-15. 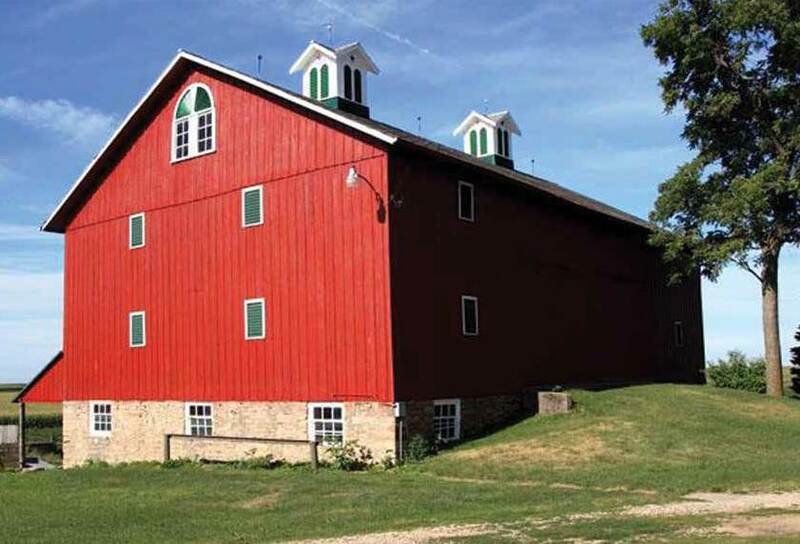 Diamond Vogel is proud to join the effort to preserve Iowa's historic barns and agricultural buildings by offering special pricing on paint and coatings to help protect our important rural heritage. Present this e-coupon (click here) to your local participating Iowa Diamond Vogel Paint Center and receive up to 40% off the published retail price list on our Diamond Vogel manufactured paints and stains. Click here for a list of Iowa locations..
As an lowa-based company, we understand the harsh climate and the challenge at hand to protect these iconic agricultural buildings for the next generation. Thank you for your investment in saving these magnificent structures. Diamond Vogel offers several types of ready-mixed red barn paints. Traditional Linseed Oil based non-flat finishes are available in "Special Red" which is a brighter and cleaner red than the red oxide color of "Rural Red" (PDF). An oil based "Rural White" (PDF) is also available. Water based, latex finishes are also available in barn red color. "Red Kote" (PDF) is a flat finish and "Vinyl Kote Gloss Red" (PDF) is a gloss finish. For white, Diamond Vogel has a number of different products for almost any application. Talk with your local Diamond Vogel Representative for the best recommendation for your specific application. Additional information can also be found on our website, https://www.diamondvogel.com/home/. We welcome your support in helping to make Iowa an outdoor museum. To receive our bi-annual Iowa Barn Foundation Magazine, we ask that you make a minimum $25 annual donation to cover publishing and mailing costs. Your donation is tax deductible! The Iowa Barn Foundation is an Iowa non-profit corporation with tax-exempt status under paragraph 501(c)(3) of the Internal Revenue Code of 1986. The Iowa Barn Foundation would like to acknowledge the service provided by Community Bank in processing our contributions and providing other services. The Community Bank, with offices in Nevada and Holstein, has a website here. You can also help the Iowa Barn Foundation by volunteering. Do you have a special skill that you think might help the Iowa Barn Foundation? We need volunteers to help write grants, to help with barn tours, and to help raise funding. Maybe you have skills that would help this effort. To become a member of the Iowa Barn Foundation, or to make a tax-deductible donation to our preservation efforts, please download the Membership Form (PDF), print it, complete it, and send it to us with your payment. Click here to find a county representative. There are over 1500 members of the Iowa Barn Foundation. Annual memberships are $25 per year. To become a member, or to make a tax-deductible donation to barn preservation and farm conservancy efforts, please complete the Membership Form (PDF). Members of the Iowa Barn Foundation help to preserve Iowa's agricultural heritage, and receive the Iowa Barn Foundation Magazine. Please complete the Membership Form (PDF). The Iowa Barn Foundation has provided this page for individuals who would like to inform others and ask questions about topics of interest for those interested in barns. The Iowa Barn Foundation reserves the right to edit or refuse any submission to this page, and can not be held responsible for any actions resulting from the use of this message board. 05-05-18 - Barn available, must be removed, in Johnson County, Iowa. A house and barn in Iowa City must be moved. Some of our readers may want the barn. Read all about it in the Little Village Magazine (Website by Little Village Creative Services). Scroll down the article for more about the barn. Aug 25, 2017 - Bob Kisken writes -- "At one time there were kit barns in these Iowa towns: Wheatland, Alexander, Toledo, Lake City, Hubbard, Charter Oak, and Alta (and maybe more). I would love to find out if they are still standing." Also, he writes -- "I am also interested in Sears and Montgomery Wards kit barns. If you want to read a good article about kit barns, Google "Sears catalogue barns" and scroll down until you get to an article by Joy Sears. This is where my interest in kit barns started." In addition, Bob writes -- "I have a photo exhibit of kit barns I am willing to lend. All one has to pay is postage. So far I have 20 photos. I have had some great help in putting these together." Related, on Aug 24, 2012, Bob wrote -- "In the early 1900s the Gordon-Van Tine Company of Davenport, Iowa, sold barn kits to farmers around the country. I have been researching the Gordon-Van Tine company and barns, and found three in Iowa that are still standing including the Dobbin Round Barn in State Center" [which is on the 2017 All-State Barn Tour]. Also - parts for that barn were shipped to State Center from Davenport. There are also Gordon-Van Tine barns in Hubbard and Sanborn. If you know where other Van Tine barns are located or if you have information about the Van Tine Company, please send Bob an e-mail, bkisken@hotmail.com. We hope Bob will write an article for the Iowa Barn Foundation Magazine on Van Tine barns. Sep 20, 2016 - Lynn Fisher, who lives near Keswick, Iowa, would like to donate his barn to someone who will use it to restore their barn. It is an 1860’s barn, wood peg construction. No track as someone removed it. He wants the barn removed so he can have more farm ground. Contact Lynn Fisher at 319-738-3714 or 319-430-2831, or his e-mail is L.SFISH68@gmail.com. Aug 11, 2016 - Delbert Longley, of Chariton, Iowa 50049, wrote, "I am in need of 2x8x14, 2x8x20/22, 1” flooring to restore my barn." His contact information is 641-203-3804, and dklongley01@gmail.com. Feb 24, 2016 - Mark Handeland contacted us regarding more information regarding barn restoration and maintenance. He wrote, "I am mostly looking to connect with others who have done maintenance on old barns or can give me info about maintaining them." See his message and some photos here. Aug 29, 2015 - Stone masonry and brick work. Clayton Stevens says he does stone masonry and brick work, and has done foundations on old barns and restoration work. His address is 404 N. 8th Ave., Winterset, IA 50273. Phone number is 515-468-1313, and his email is --tasequipment@gmail.com. Aug 29, 2015 - Move and lift barns and buildings off foundations. Billy Bell Housemoving moves and lifts barns and buildings off foundations. They have done some of the Maytag Barns. His address is 5672 W. 76th St. South, Colfax, IA 50054. Phone number is 515-994-2513, and email is: -- BBHM2002@gmail.com. Website: www.billybellhousemoving.com. The IBF is still interested in finding out more about Gordon-Van Tine barns that are in Iowa. Here is just one website about these barns - http://www.iq-servers.com/defaultwebpage/. Aug 24, 2012 - In the early 1900s. the Gordon-Van Tine Company of Davenport, Iowa, sold barn kits to farmers around the county. Bob Kisken, Wyoming, has been researching the Gordon-Van Tine company and barns. He has found three in Iowa that are still standing including the Dobbin round barn in State Center, which will be on our all-state barn tour. Parts for that barn were shipped to State Center from Davenport. There are also Gordon-Van Tine barns in Hubbard and Sanborn. Links to websites containing information about the Iowa Barn Foundation and Iowa barns. The Daily Nonpareil, Shelby County barns featured in this weekend’s statewide barn tour, Sept 23, 2017. The Hawk Eye (Burlington, IA), Iowa Barn Foundation’s all-state barn tour, Sep 7, 2017. Quad City Times, Photos: September Barn tour, Sep 1, 2017. New York Times, If These Barns Could Talk, By Ceil Miller Bouchet, June 1, 2012. New York Times, Slideshow for the article, If These Barns Could Talk, June 03, 2012. Omaha World-Herald, A labor of love as old Iowa grain elevator undergoes restoration, by Andrew J. Nelson / World-Herald staff writer, Jun 26, 2015. Website for Save the Ross Grain Elevator, the grain elevator in the article listed above, which received a grant from the IBF. Parkersburg Eclipse News-Review, Local barn to again be featured on Iowa Barn Foundation tour, Sept 27, 2016, about the Younker Family Heritage Farm. Times Republican (Marshalltown, IA), Barn gets a new lease on life, Jan 24, 2016. Des Moines Register, Take a tour: Historic barns in the Iowa countryside, Sept 30, 2015. Nevada Journal, Five Story County barns featured on state tour, by Ronna Lawless, Sept 24, 2015. Newton Daily news, Starek: Artist, photographer and barn lover, Friday, July 3, 2015 (Ken Starek is the Hardin County Representative for the Iowa Barn Foundation). Barns: Icons of Our Agricultural Past. (PDF). This article about Dubuque Area barns appeared in the July 2015 issue of Julien's Journal. Los Angeles Times, With barns disappearing in Midwest, a preservation movement rises, Oct, 2014. Omaha World-Herald, Across Iowa, barns in infinite variety to welcome the curious, By Andrew J. Nelson / World-Herald staff writer Sep 22, 2014. The Daily Gazette, Barn preservationists pushing to save symbols of the heartland, Sept 2014. Omaha World-Herald, A photo of The Kraayenbrink Barn - Olivia Kraayenbrink, 8, looks out of the hay door on the second floor of the barn at the Kraayenbrink farm in Sioux Center, IA Wednesday, June 18, 2014. The Iowa Barn Foundation has organized a barn tour for northwest Iowa. Evan Kraayenbrink bought the barn, built in the 1870s, to ensure it wouldn't be torn down. View a video from a WHO-TV newscast. WHO-TV presented a 5-minute feature about restoration of area barns made possible by the Iowa Barn Foundation, on their 10 o'clock newscast, May 20, 2014. Omaha World-Herald, Grand old Iowa barn is standing tall, will be featured on annual tour, By Andrew J. Nelson / World-Herald staff writer Sep 24, 2013. Globe Gazette, A barn with a sense of history, by Bob Fenske, for the Globe Gazette Sep 19, 2008. Daily Gate City, "You gotta have Faeth", a story of a barn, the only one of its kind in Iowa, and how it became a show piece (Dec 2003). 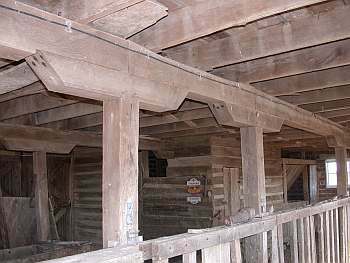 Find more links devoted to barn preservation and farming history on our web page Museums & Barns on the Web. Use the menus to see details of our tours. Go to the Iowa DOT map, then click on a County. © 1997-2019 Iowa Barn Foundation. All rights reserved. This material may not be published, broadcast, rewritten, or redistributed without express written permission from the Iowa Barn Foundation. Updated 04-22-19.